When Jasmine from Confessions of a Cardamom Addict tagged me for the recipe meme, I was leaving for New York. I tabled the meme for a short time due to work and CBBP #1. Now that I have a little breathing room, I thought I’d get down to it. My recipes come from a variety of sources. Many are from friends, family and places that I have worked. I like to construct recipes from principles and techniques with which I have a firm foundation. 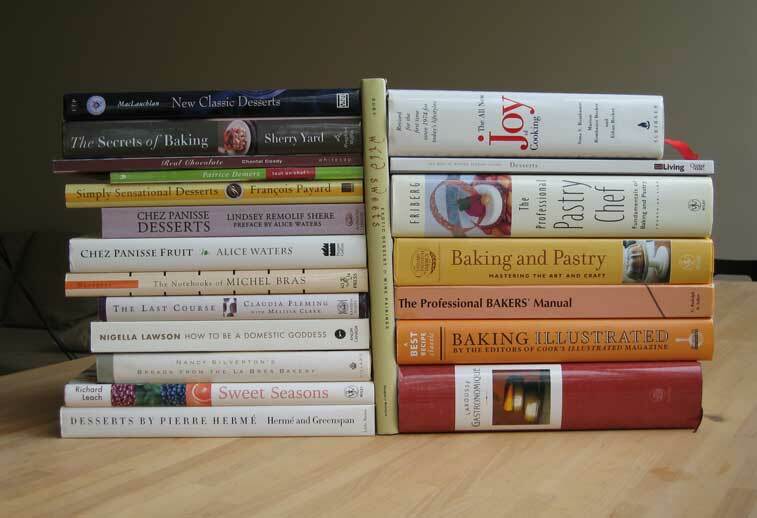 I also use my favourite cookbooks: for instance, I am fond of the Joy of Cooking. More recently, I find myself looking at recipes on the Internet, in magazines and within other food blogs. I like to prepare one new recipe a week—two or three if I am feeling ambitious. Otherwise, I’m pretty lazy. I have a computer database in which I store many of my recipes, and I seem to come back to it time and again. Like Jasmine, my database is organized and cross-referenced in a number of ways: alphabet, category, flavour, ingredient, source, etc. I also have a binder where I store duplicates of the recipes. The recipes are in plastic sleeves, so that when I make a mess, which is often, they can be quickly wiped off. My cookbooks and pastry books are getting unruly. During my recent trip to New York, I bought seven. Yes, my luggage ended up being heavy! I previously mentioned my online database, but since we are talking recipe pile, I have approximately 24 binders of recipes. They are labeled from A to Z and are organized by author. Other binders on my shelf include notes, research and clippings from magazines and blogs. Are you ever going to make those recipes in your to try pile? No—not all of them. Many are only there for inspiration or emergencies. If I have never made a dessert/pastry before, I generally follow a recipe to the word. If I think a recipe is fantastic, I usually don’t mess with it. I only modify and change a recipe when I think it could be improved or when I wish to test its limits. I’m not afraid to try recipes. I’m often too lazy to make something that will take an inordinate amount of time. Except, when I have a purpose, I will be in the kitchen till the task is done. Tag at least one food blogger you visit regularly but never interacted with? 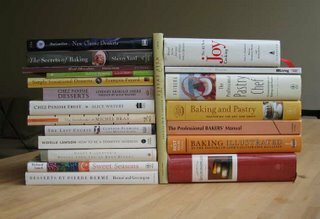 Posted by Sam at 4:48 p.m.
Judging from your picture I own most of the same cookbooks you do ... great minds think alike! Thanks Ivonne. I love books!